My travels through the Indian Himalayas are continuing to flow long relatively well. I remain fit, healthy, unscathed and, most importantly, continually inspired and educated by the right people, the right books and the right places. Once again I must apologise that this journal is now a couple of weeks out of date. I had the intention of sending within days of my time in Kashmir, but was unable to finish my writing before undertaking one of the most challenging, yet rewarding experiences of my life – a 10 day retreat in an ancient technique of insight meditation called Vipassana. In a dark forest isolated from the outside world and almost all sensory distractions, I have been taking my quest for inner peace to another blissful level – but I’ll save the details for my following journal. I believe the last time I wrote I was on top of the world (literally!) in awesome Ladakh. I will continue with my journey West. 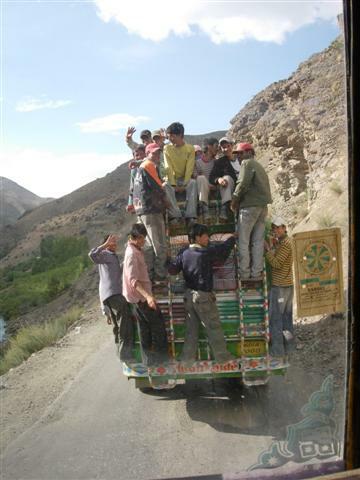 On the morning of my departure from Leh, myself and my two Aussie travel-mates arrived at the chaotic bus station at 5am and with bleary eyes searched for the ‘deluxe’ bus that would take us over the mountain ranges to the exotic land of Kashmir. We were about to experience another truly Indian enigma: the oh-so innocent switch from the simple comforts of a decent bus (at least one with suspension!) to one of the local rusty rattlers, or as I like to call them – ‘cattle class’. We were 3 big, robust Aussie lads on a single bench seat made to tightly fit 3 small Indians. Our hips could just fit, but our shoulders were far too broad – two of us could lean back at any one time while the third man would have to lean forward. We took our positions in shifts. Despite the cramped conditions and much to their credit, the lads kept their spirits up and we learned to smile our way through every frequent sharp corner and jolting bump that came our way. The first day we covered only 200 km in 10 hours on the road, arriving in the evening close to the muslim community of Drass, a region which has the unenviable record of being the 2nd coldest place on earth (I’m not sure who takes 1st place, but here it can get to -60c!). Reputedly, this is also the bed-bug capital of the world. It was a very short rest for all concerned though, as we were told that the bus will be underway again at 2am as strict controls were in place for the times we could cross the heavily militarized mountain passes ahead of us. On this part of our journey we were traveling close to the Line Of Control which separates the disputed borders of India and Pakistan. As our driver expertly nursed our jam-packed and ailing bus over the final mountain pass, the landscape evolved quite dramatically from rocky desert vistas to one of the most fertile and breathtakingly beautiful regions I have ever laid eyes on – Kashmir. All discomfort from our long, long ride was soon forgotten as the bus descended into a land of lush, green mountain meadows and ancient pine/fir forests surrounded by towering snow-capped ridges and peaks. This was mountain scenery that matches the very best of Switzerland or the Canadian Rockies, almost fairytale-like in its raw beauty. 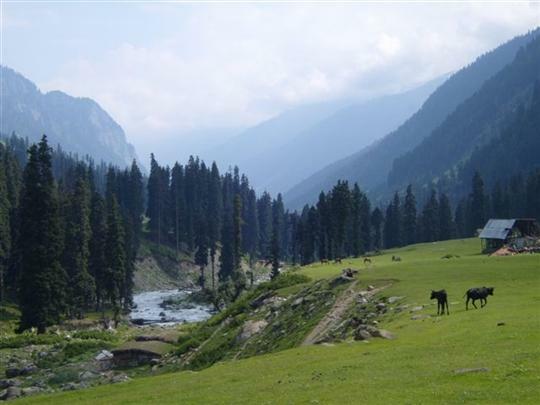 Yet, because of this natural beauty, Kashmir is also a land with a long history of ongoing political violence. As little as 8 years ago, this area was decribed by the then US president, Bill Clinton, as “the most dangerous place on earth”. The Indian and Pakistani governments wish to claim Kashmir as their own and since their first conflict in 1947 the region has remained a flashpoint between the two countries. The people of Kashmir just wish for their own independence and has produced powerful militant groups striving for this aim. This has created a situation of unpredictable danger throughout Kashmir, and wherever I travelled their was a huge military prescence to contend with. The soldiers on patrol are heavily armed and decked out in helmets and body armour, roadsides are lined with razor-wire and there are machine-gun bunkers frequently found on street corners. Roadblocks and bag searches are common practice, and many times I have been stopped and interrogated. Thankfully, being an Australian is a true blessing here – one look at my passport and these hardfaced soldiers and policemen would light up with a beaming smile and congratulate me on being a cricket champion of the world. Just drop a few names like Ricky Ponting or Shane Warne and they will treat you with an open and friendly respect, often earning a vigorous handshake. The capital city, Srinigar, is famous for the large lakes it has been built around, and even more famous for the hedonistic houseboats that are anchored around their banks. 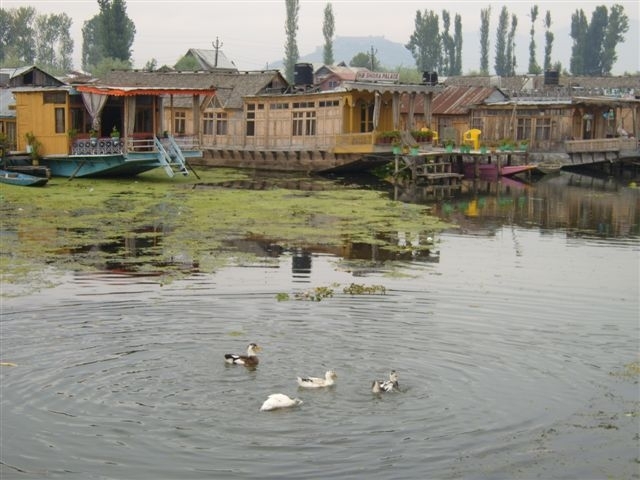 With their faded elegance, the houseboats are leftover from the British Colonial era, when the English would escape the heat of the southern plains for the cool heights and beauty of Kashmir. Apparently, being unable by law to purchase land here, the clever Brits built these floating palaces for themselves. Filled with antique furnishings, carved wooden facades, delicately coloured leadlight windows and plush deckings for long, lazy days of watching life on the lakes drift past, many may be past their glory days, yet most of the boats have remained well-maintained and quite charming. Luxurious gondolas slip past carrying what little of the tourist trade remains. These are truly something – a pimped up ride with throw cushions to lie back over and lunch and English tea served on request. My friends and I hired one for the day (with guide and paddle boy), and took a tour of the local lakes and surrounding canals. Around us were large floating gardens of lotus lilies, local fisherman and craftsman plying their trade from rowboats, amazing lakeside architecture and a multitude of birdlife living amongst the vegetation on the waters. In many ways Kashmir does have the feel of country that is independent of the rest of India. 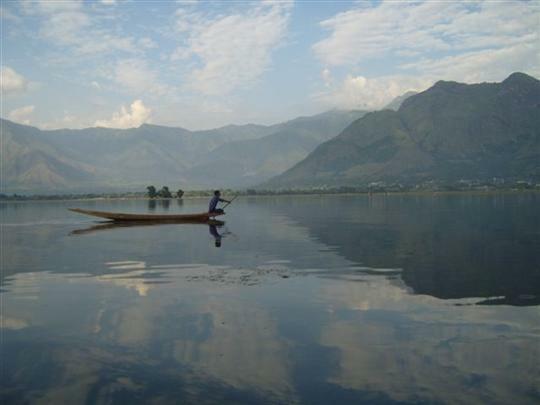 With strong roots in the Islamic faith, Srinagar shares more in common with the cities of Central Asia. Many men wear long shirts and long beards, many women remain covered from head to toe and wear dark masks over their faces. At routine times of the day, songs of prayer are broadcast from the mosques and, drifting over the breeze on the lakes, these sounds add a dreamy and surreal feeling to an already exotic and colourful place. Westerners are a rarity on the streets of the old city and I was met with some curious, suspicious and often hard stares while visiting one of the central mosques. My presence seemed to invoke mixed reactions from the locals. Children followed me around as if I was a Bollywood star, then at one point, on a crowded waterfront street, a stone was thrown at my head. Although feeling calm and centred, I also learned to keep my guard up. I believe the Kashmiris may very well be the best (and most insistent!) salespeople in the world. To be enticed into one of their stores is truly an experience to behold. They will lead you in by the arm, seat you comfortably and serve tea as if you were an honoured guest visiting the inner sanctum of their home. Then, beginning to display their wares one by one in a steady stream, they will watch your expression with a hawk-like concentration until you show the slightest interest or admiration for an item – and now it’s game on and the hard sell begins. An inexperienced and naive traveller can often feel obligated to purchase just because they have been treated so special! I believe it is not uncommon for a customer to walk out of a Kashmiri store with an armload of treasures, their wallets emptied and finances devastated, wonderng what the hell just happened in there!! I have learned early to toughen my resolve, assertiveness is a must with these guys, but so many of the crafts here are exquisite and painstakngly made, and there is much to admire. After a slightly uncomfortable stay on a houseboat owned by an overzealous shawl salesman, my friends and I moved to a quieter part of the lakes on a beautiful boat owned by a family of Sufi Muslims. The Sufis are the philosophers, mystics and poets of the islamic religion and these were a wonderful, generous and warm family to stay with. Their kindness and goodwill was inspirational, and they shared valuable insight and guidance from their faith. 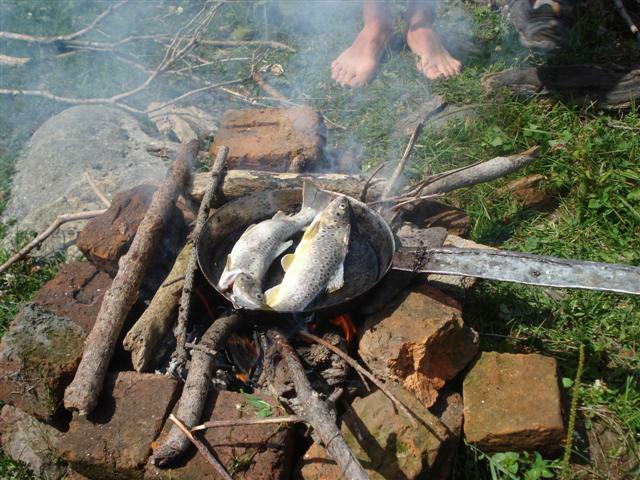 Together we shared a daytrip into the mountains to try our hand at fly-fishing and caught many tasty rainbow trout for a campfire fry-up on the river bank. 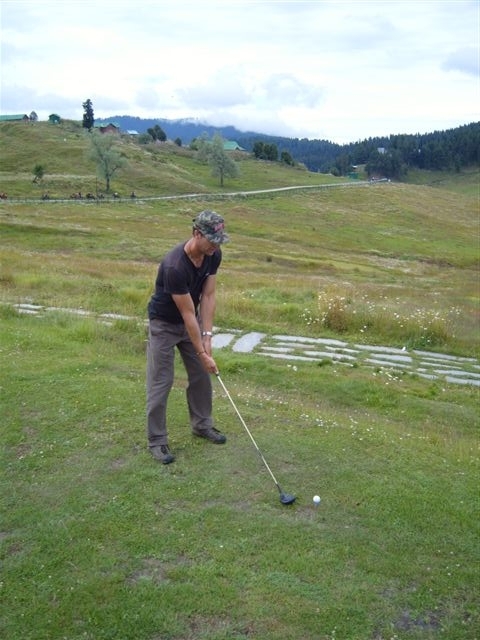 Other journeys into the mountains of Kashmir included taking a horse trek for the day from the village of Aru to some amazing viewpoints, and a challenging round of golf on the worlds highest golfcourse near the ski resorts of Gulmarg. With obscure threats of militant clashes and kidnappings in these regions, tourism remains very quiet. I felt fortunate to share the beauty of these places with so few other travellers, often finding myself in peaceful solitude. After a few days of chilling out in McLeod Ganj as I recover from my intense studies in Vipassana, the next stop on my journey will be to the sacred Ganges River and the famous town of Rishikesh – believed to be the Yoga capital of the world and the place where the Beatles came in the late sixties to study under their guru and produce the most trippiest tunes of their career. Wishing everyone peace, love, light and happiness. I certainly feel as if I’m brimming with them after my meditations. Heavily armed soldiers are everywhere. Good to hear from you. I tried sending an e-mail from Kashmir a few days ago but the server crashed just as I completed it! Bad connections up there. I have just arrived back in McLeod Ganj after my stay in Kashmir. I have never seen a region of such stunning natural beauty, but unfortunately it is tainted by being a near war-zone. Heavily armed soldiers are everywhere. I was continually stopped in my travels to be searched and interrogated, but once they saw I was an Aussie they treated be with smiles and respect. There are still very few tourists in the area as security forces patrol the streets and mountain resorts, but I felt I had to see the place and it was well worth any risk. In the mountains I went trout fishing and on a horse riding trek as well as playing a round of golf on the world’s highest golf course. In the capital, Srinigar, I stayed on a houseboat owned by the most genuinely kind and friendly family of Sufi Muslims. Many of the wonderful conversations I shared with them has changed my outlook on life. I have had a very long and hard journey over the past 24 hours. The roads were flooded and washed out at some points and we had to detour several times costing many hours. There was also a transport strike near my destination and I had to leave my jeep ride to finish the last stage of my journey on a packed local bus. Not much fun after driving all night! I’m here safely though and ready for some rest. In 2 days I begin my next meditation course but I’ll call before then. I’m really surprised my books arrived so soon, they told me 2-3 months by sea! Considering I sent it from the isolated Himalayas, I’m impressed. I am preparing a parcel of clothes to send back soon, I need to free up some room in my pack. Love you both, please give Bella a big hug for me too.